Sorry, no review of Big Crown: Showdown yet. 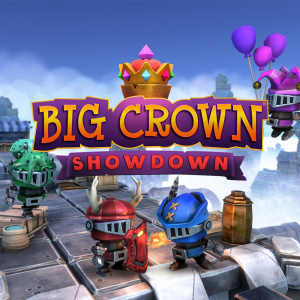 Big Crown: Showdown sees friends become foes as they compete for the crown in 4-player local and online multiplayer combat, set over 3 wacky worlds full of medieval shenanigans. Avoid perilous hazards and engage in frantic fights as you attempt to knock your opponent’s off 15 crazy courses in the ultimate royal battle! Pick Up and Play Combat: Big Crown Showdown is an accessible and enjoyable experience for players of all ages and skill levels. The one-button combat provides a true ‘pick up and play’ experience whilst still containing enough depth for players to come back for more! Non-Stop Camera: Big Crown Showdown uses a unique camera system that moves along the track in a constant motion, forcing players to keep moving forward into new challenges. There’s no time rest when the camera keeps the action going!